All tutoring sessions within the scheduled times are free to UNCG students enrolled in the classes listed here. Tutoring is provided on a walk-in first come first serve basis. No appointment is necessary. Students enrolled in online courses will be contacted about virtual tutoring options via the Math Help Center Canvas Organization. Contact Tracey Howell thhowell@uncg.edu if you have additional questions. 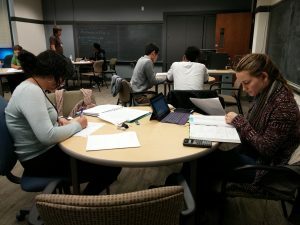 UNCG Student Success Center offers tutoring and academic support in other UNCG non-math related courses. Questions concerning mathematics tutoring may be addressed to the Mathematics and Statistics Department Office, 336-334-5836, or to the Math Help Center coordinator, Tracey Howell, at thhowell@uncg.edu. Questions concerning statistics tutoring may be addressed to the Mathematics and Statistics Department Office, 336-334-5836, or to the Math Help Center coordinator, Tracey Howell, at thhowell@uncg.edu.